Get e-mail in the back yard! Read news sites in the bathroom! Update your weblog from the porch or the kitchen! Back up files from the couch! Sounds fun, doesn't it? But what if you have an old, old laptop? It's still possible, and this page will help you get there. This page doesn't cover everything you need to know, but should be enough to get your wireless network going, especially if you're setting up a small home network similar to mine. 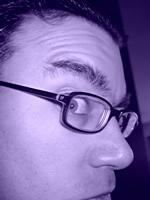 You can also try Michael J. Norton's article about his own PowerBook 1400 for another perspective on the same issue. If you're using wireless networking in an office environment, you should look into beefing up your knowledge of virtual private networks (VPNs) and other security measures, as well as how to use multiple wireless access points in a widespread network. IMPORTANT: At least one reader has reported to me that he could not make any Wi-Fi PC Card work with his Lombard PowerBook G3, but others have had success with machines as old as the pre-PowerPC PowerBook 500 series—so be aware that your mileage may vary. Did you find this article useful? Feel free to consider making a donation (any amount, credit cards accepted) via PayPal to buy me some yummy coffee and more gadgets to play with. Thanks! Additional Tidbits > Change Your Password! Out there in the world, there are other Web resources to help you get a PowerBook 1400 or other older Apple laptop online using Wi-Fi wireless networking ("other" means a PowerBook 5300, 2400, 3400, or the first two models called PowerBook G3, as well as—with some effort—the pre-PowerPC PowerBook 190 and 500 series). However, in the process of trying it with my own 1400cs in March 2003, I didn't find they gave me all the information I needed. I hope this page does, for those others trying to do the same thing. Much of this advice might even work for a PC laptop (or Mac or Windows desktop computer, for that matter) with a PC Card (PCMCIA) slot or adapter and at least Windows 98. NOTE: I go off on some techie little rants in this article, often just to elaborate on something not very pertinent. So if you don't understand something here, you can probably ignore it. There are also a lot of steps and bullet points, because I go into quite a bit of detail. You should be able to skim and get the gist of it, then go back to read further if something doesn't work. Have fun! Newer laptops, whether from Apple or other manufacturers, either include or have as an option built-in technology for using wireless networks. But if you have an older PowerBook, AirPort networking is officially "unsupported." That doesn't mean you can't use it, though. The Apple PowerBook 1400 is a remarkably capable laptop for its age. Originally introduced in 1996, it is approaching its seventh birthday as I write this—on a PowerBook 1400 using a wireless network in my house. The 1400 was not built for wireless local area network (WLAN) networking. No one thought to let it use the 802.11b wireless protocol (also known as Wi-Fi, or AirPort to use Apple's terminology)—because 802.11b didn't even exist at the time. The 1400 is hardly built for the modern computer-plug world at all, in fact. Most 1400s lack built-in Ethernet (it was an add-on)—they use Apple's old LocalTalk serial networking instead. There's SCSI (not FireWire) for external disks, Apple Desktop Bus (not USB) for external keyboards and mice, and other now-obsolete technology. Wireless networking cards, which is what we want. 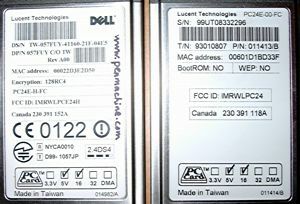 The PowerBook 5300, 2400, 3400, and G3s also have PC Card slots, with similar benefits. Even the pre-PowerPC PowerBook 190 and 500 series can go wireless with some luck and effort (see the "another note" below). NOTE: I had initially thought, as Accelerate Your Mac reported, that the even-older PowerBook 5300—infamous for some units' catching on fire in the mid-'90s—could only be corralled into working with 802.11b/AirPort networks using an older version (release 6.0) of the ORiNOCO/WaveLAN driver, as well as Mac OS 8.6, since 9 is too slow on that ancient hardware. Andrew Kershaw, developer of ClassicStumbler (mentioned below), reveals that my directions here "work 100% on a 5300 with OS 8.6. I set up my 5300ce and 5300cs a while back with WaveLAN Silvers and ORiNOCO 7.2 drivers." So there you have it. 5300 owners, go wild. Just makesure you have the right kind of ORiNOCO card, as I describe below. ANOTHER NOTE: Even more interesting, reader Kevin Rist wrote to me that "the 500 series PowerBooks—old 68040 machines [also known as the "Blackbird" series - D.]—had a PCMCIA card expansion bay module option, which are rare since the standard had just been introduced. Believe it or not, this PowerBook works with the ORiNOCO card and the v. 6 driver! Not that too many people will want to surf that way, but just thought you'd get a kick out of knowing!" I sure do. 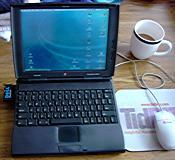 Reader Dan Palka adds that "I now have a wireless PowerBook 190cs that I use almost every day on my airport network. [...] I find it thrilling to use a laptop so old with such new technologies. It really shows the longevity of Apple hardware. The 190cs is running MacOS 7.6.1." The 190 is essentially a 5300 with an older processor in it, so it makes sense that if the 500 series works, so would the 190. That means that PowerBooks that are nearly ten years old as I write this can be put onto a Wi-Fi network, if they're running Mac OS 7.5.5 up to 8.1 (which is the latest they can use). The Wi-Fi networking standard didn't appear until years after the 500-series PowerBooks were discontinued, so that's pretty neat. Of these machines, all but the second-generation PowerBook G3 (code-named "Wallstreet") are also incapable of running Apple's spiffy new Unix-based Mac OS X operating system. The rest of this article therefore focuses on the so-called "Classic" Mac OS, specifically Mac OS 9, although Mac OS 8.6 and even some earlier versions back to 7.5.5 should also work. If you are running Mac OS 9 on a newer PowerBook G3 or G4, these instructions also apply if you're using a PC Card instead of Apple's AirPort card—with some tweaking if you use Mac OS X. Enough chit-chat. Let's get going. To get yourself all Wi-Fi'ed up, you don't need much: a PowerBook, a wireless card, an access point (base station) or wireless router, some RJ45 Cat-5 Ethernet cables and a computer to plug one into (it can be your PowerBook if you have a regular wired Ethernet card), and—if you want to make it easier to get the software you need, while planning to do anything other than move files around your own network—some sort of Internet connection, preferably broadband through a DSL or cable modem. You also need the right software, including a compatible operating system, networking components, the right wireless drivers, client software, and up-to-date wireless firmware for your card and access point. The book is available at a discount from Amazon in the U.S. and Canada, from Chapters Indigo in Canada (at a similar discount), and from its publisher Peachpit Press (also at a discount, but with hefty shipping charges outside the U.S.A.). 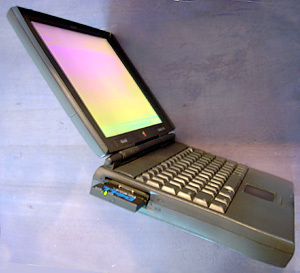 A PowerBook - One with a PC Card slot and Mac OS 9 (or some earlier versions, depending on the software you download). If you have a PowerBook that supports AirPort, you can still follow these instructions, but you have other alternatives. Similarly, if you're using Mac OS X, you can definitely use Apple's AirPort card, or a third-party card with appropriate new drivers. You have many choices—go play. There are three models of the card, which differ only in the kind of security encryption they support (more on that below). Gold models support 128-bit WEP encryption (which has its flaws, but is good enough for most purposes), Silver models support 64-bit encryption (tolerable), and Bronze models use no encryption. WARNINGS: It seems that Proxim may be making newer 802.11b PC Cards that may not work with older Macs, but have the same ORiNOCO name. When in doubt, look at the shape of the slab antenna on the end of the card. If it's rectangular and blocky, like the photos here, you should be okay. If it's more curved at the edges, you might be out of luck. 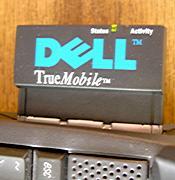 It seems that the Dell TrueMobile 1150 model is definitely the correct one, so you can always try that—and they're cheap on eBay. Also, I first tried an older Lucent WaveLAN Bronze card, but it didn't work. I don't know if I had a bum card, or whether it was simply too old to work with my wireless access point. It's possible that it only supports the first-generation, slower (2 megabits per second) 802.11b standard, and that my newer (11 mbps and 54 mbps) wireless stuff couldn't handle that. Therefore, I recommend a Silver or Gold card, whatever the manufacturer. Only the Silver and Gold are still on sale new, and you may be able to bump the Silver up to Gold with a firmware upgrade you can perform yourself—if you can use a friend's newer Mac to perform the process using Apple's AirPort upgrade software. The ORiNOCO drivers and software support a wide range of operating systems, from Mac OS 7.5 to 9, as well as various flavours of Windows and Linux. 802.11b PC Card from MacWireless - This card is much newer, and I'm not sure what chipset it uses, but it has drivers for everything from Mac OS 7.5 through Mac OS X, as well as Windows and Linux. I haven't tried it personally, but given the name of the company, it's likely to work pretty well with any Mac that will let it plug in. The MacWireless brand is not as common in the used market as the panoply of Lucent-derived cards, but pricing on new cards is coming down all the time. NOTE: If you're able to use Mac OS X, there is a free open-source driver for a variety of wireless cards, as well as a similar but separate commercial one available for sale by IOXperts (thanks to PinzaTodd for the free driver link). Software. Some access points may only work on Windows for the initial setup. Apple requires a Mac for their AirPort Base Stations. Others have software that works equally well on both platforms. Still others have better software for Windows, but do at least provide Mac support, and maybe Linux too. Usually, once you do the initial setup, you can make all other adjustments from any normal Web browser, so if you get a good deal on a so-called "Windows-only" access point, you can always borrow a friend's PC for an hour (or figure out a workaround) and then use a Mac from then on if you need to change anything (which you probably won't). Appearance. Apple's Base Station looks like a flying saucer. The Linksys access point I bought is blue and black with blinky lights, just like the DSL router it sits on, and has two antennas. Microsoft's stuff sits vertically. D-Link's is very thin. The original Lucent ORiNOCO access points are all swoopy like the Sydney Opera House. Manufacturers have used all sorts of designs. Pick one you like. If it will sit on a shelf in a closet like mine, maybe just pick the cheapest one. The latest models support not only 802.11b networking—which maxes out at 11 mbps of bandwidth, like the 10 mbps of traditional 10BaseT Ethernet—but also the newer 802.11g standard, which has a theoretical maximum throughput of 54 mbps. That variant is also known as "Wireless G" or "AirPort Extreme." WARNING: 802.11g is fun and cool and everything, but not too useful yet. Since the standard is not yet set in stone, 802.11g gear from one manufacturer might not work with 802.11g gear from another. The PowerBook 1400, with its 16-bit PCMCIA slot, hardly supports higher-speed networking of any sort, since all of the wireless 802.11g cards I've seen—and most of the wired 100BaseT Ethernet PC Cards too—use 32-bit CardBus slots. As well, even though I bought a Wireless G access point (the WAP54G from Linksys), I'll see no real benefit from it for now because the rest of my network is only 10 mbps anyway. Even if I were to upgrade to a faster network all around (including a new laptop), broadband Internet connections are much slower than 10 mbps regardless—it would only speed up file movement inside my house. By the way, I'll just call the access point, base station, or router the AP from now on, to save space. Cables and hubs - If you're like me, you have Ethernet cables all over the place. If not, chances are your AP and other equipment come with what you need. Best to check, though, since it can be frustrating to be all ready to set things up and then find you have one fewer cable than you need. (For the same reason, make sure you have enough electrical outlets for all the stuff you're plugging in, with enough room for all the AC adapter bricks.) If you have a simple access point and not a router, you might also need an Ethernet hub or a separate broadband gateway or router (see the next item). An Internet connection - I have a high-speed ADSL connection from Telus, my local phone carrier. You might have DSL, or a cable modem, or an old-style dialup connection (you have my sympathy), or a T1 line into your office, or whatever. Whatever it is, an Internet connection makes your wireless LAN much more useful. Whether you need a DSL/cable gateway or router depends on your particular setup. I'm going to assume you already have your wired Internet connections set up and working, since this article is long enough already. A computer with wired Ethernet and a CD-ROM drive - This can be your PowerBook, but doesn't need to be. While many APs might just work out of the box, they usually require a wired computer for the initial setup using software from a CD-ROM (or maybe downloaded over the Internet). I used the Windows 98 PC in the den—since the Linksys setup wizard is Windows-only, for no good reason I can determine. The right operating system - I talk about Mac OS 9, but a PowerBook 1400 running Macintosh System 7.6 (it will not run 7.5.5) can even be made to work, and Mac OS X is built for wireless right off the bat. For my 1400, which has a PowerPC G3 processor upgrade, Mac OS 9.1 (9.2 only runs on newer Macs) does a good job. If your machine runs a pre-G3 processor, Mac OS 8.6 might be a bit snappier. NOTE: If you're on a PC, Windows 95 might be forced into the job, but Windows 98 or newer is better, while Windows XP has wireless networking wizards built in. If you're a Linux-head, you're used to figuring this sort of stuff out, so go do that. 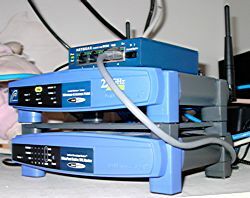 Networking components - Chances are you installed the right networking bits with your operating system, but if you didn't—to save space, because you didn't think you'd be doing anything this fancy, whatever—then you need to now. Make sure you have TCP/IP components (for Internet access) and Ethernet software (for general networking) on your PowerBook. Try clicking on the Apple menu and navigating to Control Panels > TCP/IP. If the TCP/IP control panel is there, you're probably okay. If not, you might need to boot from your Mac system installer CD (put in the CD and restart with the C key held down), then possibly do a custom installation to force those things onboard. A wireless driver for your PC Card - It sure would be nice if Apple's AirPort software supported non-Apple wireless hardware on the PowerBook 1400, but it won't even install. Some counsel trying to force it to work by dragging in the component parts manually, but the Web references I found about that seem to have disappeared, and I couldn't manage it. Proxim has an older version 6 driver for pre-Mac OS 8.6 systems. There are also Windows, open-source Mac OS X, and commercial Mac OS X drivers. The MacWireless drivers come with the card, or you can get them at the MacWireless site. If you have another card, check the manufacturer's site. Wireless client software - What I'm talking about here are the applications or control panels that let you scan for a wireless network, set up your connection, enter encryption keys (if any), and monitor signal strength and network status. For instance, the ORiNOCO 7.2 software includes a monitoring control panel, a setup assistant (a.k.a. setup wizard), and a control strip module that also shows signal strength and lets you switch settings. Usually everything gets installed along with the driver, but your card maker might make you install it separately. As with the driver, the client software is generally customized for your particular hardware card. NOTE: You can also add extra software, such as a wireless network scanner like ClassicStumbler or the (apparely defunct) AP Scanner. Those two require Apple's AirPort software to work, though, and so don't seem to want to work on my 1400. You will have better luck if you're installing a Wi-Fi PC Card on a Mac that would support AirPort, like a newer PowerBook G3 or G4, which also has the AirPort software onboard. Card and AP firmware updates - Even if your hardware is brand new, it could have been sitting on a warehouse or store shelf, and the manufacturer may have released updated firmware for it in the meantime. If you've bought used equipment, updating the firmware is particularly important. So you might want to update your firmware, especially if you have mysterious problems getting your stuff working together. ORiNOCO's card firmware unfortunately seems to require a Windows PC (it's included with the Windows driver, in fact), so you might need to borrow a PC laptop or take your card and a CD with the Windows updater program to someone who has one. Apple, of course, lets you update firmware from a Mac—but not the 1400, it seems, since it isn't AirPort capable—and their update software might even put newer firmware on ORiNOCO cards if you're lucky. I'm not sure whether MacWireless includes firmware updates with their software downloads, or whether they just haven't released any yet. NOTE: Firmware, as its name indicates, isn't transient like software or tangible like hardware—it's in between. Firmware is the programming instructions stored in non-volatile memory inside your wireless card and AP, instructions that tell the hardware how to work with other wireless equipment. The fancy Web-based configuration pages used by APs are also stored in their firmware. Like software, firmware has bugs, and can be updated with new features. Once the 802.11g standard is finalized, for instance, manufacturers will release updated AP and PC Card firmware so wireless hardware can "speak the correct language." Equipment with the most up-to-date firmware is most likely to work correctly with other equipment from the same manufacturer, as well as that from other companies. Okay, that's all you need. (I think.) You have the hardware. You have the software. Time to start plugging and installing. Let's rock. Run the AP software. In my case, the Linksys setup program only ran from a CD on a Windows PC, so that's what I did. If yours has a Mac setup program, great, run that. If you have to do stuff manually with a Web browser or some other configurator, do that. Again, see your AP instructions. Ensure the device is broadcasting that SSID. Use the default wireless channel (channel 6 for me). Make sure encryption is off (it usually is). Don't change any passwords (usually admin or something like that) or user IDs. Leave the standard IP address and DHCP settings. Stay in infrastructure mode, not ad-hoc (peer-to-peer) or anything else. We'll go back and modify all of it later (you really must at least change the password), but it's easiest to get things working on a stock system first, then play around. Make sure the AP is working. If you or a friend have an already-working wireless laptop, see if it can detect the AP wirelessly. If not, make sure the setup software did its stuff correctly, and check the status lights on your AP. As always, read its instructions to see what you need to know. Do any further setup steps. A wireless router (rather than a simple access point) might require some further settings, especially if it's acting as a gateway or firewall between the Internet and your internal network. I have a separate broadband router that takes care of all that stuff, but I had to go through the setup rigamarole anyway, months ago when I put it in. Regardless, that's beyond what I cover here. Again, read the instructions. You now have a wireless network running, even if it only has one wireless node (your AP) on it. Anyone in your immediate vicinity (except you, so far) can use it if they're in range (within a few dozen metres, at most) and looking for one. If they make some intelligent guesses, they can also change its settings. But don't worry about that for now—we'll protect everything soon enough. 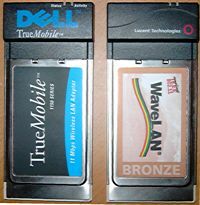 Insert your wireless card into one of the PC Card slots. WARNING: You should probably use the upper PC Card slot, since most 802.11b antennas are attached slabs, like the one on my Dell card. If you put it in the bottom slot, the antenna might block you from getting other cards in and out of the top slot, and from connecting anything to them once they're in. NOTE: Your driver installer might not actually require that the card be inserted, but it probably won't do any harm. Some installers, on the other hand, might refuse to work if they can't detect an appropriate card. Start up the computer. By the time the Finder and desktop appear, it likely warns you that no driver for your card is installed and asks you to eject it. Choose Cancel and keep the card in. The card still mounts on the desktop, likely with some name identifying it and the manufacturer. Run the driver installer. In the case of the ORiNOCO driver, that involves double-clicking a self-mounting disk image, then double-clicking the installer once the disk image mounts. Choose the standard installation options, unless you have a good reason to do otherwise. If you're using the ORiNOCO drivers, check the box that runs the setup assistant after the installation—sure, you could run it later manually, but why not save a step? Restart the PowerBook (if the installer doesn't do so automatically), or shut it down and start it up again. (Macs not running Mac OS X generally don't load drivers dynamically, so you have to restart before anything comes to life.) If your PC Card automatically ejects during the restart process (mine didn't, but you never know), reinsert it before the icons start marching across the bottom of your screen, or the driver is unlikely to load and you'll have to restart again. You should see at least one light on your PC Card, if it has any at all, and it should show up on the desktop with an appropriate name. My Dell card, for instance, is called ORiNOCO on the desktop with the driver installed, even though it wasn't beforehand. Like all ORiNOCO/WaveLAN variants, it also has two little green LEDs on top: Status (which lights steadily when the power is on and the card is active) and Activity (which flashes when there's network traffic). See your card's instructions or online help for information about your own pretty lights. (You can get manuals for the ORiNOCO and MacWireless cards online.) If no lights are on, you might need to reinstall the driver or software, or update some firmware. If the configuration assistant or other setup program doesn't start up, run it now. For the ORiNOCO card, that means going to Apple Menu > Control Panels > ORiNOCO and then choosing File > Run Setup Assistant. Choose to join an existing network (the one you just set up). The exact wording varies depending on your software. You might need to create a new network configuration manually, or a wizard or assistant program might step you through the process. Join the network with your SSID. Your card should scan for and automatically detect wireless networks in the area, including yours. The SSID (Service Set IDentifier, or wireless network name) you pick should be the default for your AP (it was linksys when I started, but I changed it to penmachine after I got everything working). If there are other wireless networks in range (my dad has one called apratec), make sure you pick the right one. Turn off the card's power management. Many cards let you set them to power down when they're idle and the PowerBook is unplugged, to save battery power. (How you do this depends on your card software—it will be somewhere in the setup process or the monitoring application.) I found that my Dell card kept losing its Internet address when I did that, so I keep it powered on unless I explicitly turn it off using the ORiNOCO control strip. Create a TCP/IP configuration for your card. The configuration tells your PowerBook to use the wireless card for Internet networking, instead of wired Ethernet, LocalTalk, or anything else. The ORiNOCO assistant can do this automatically (which is simplest), or you can do it from the TCP/IP control panel, which is where we're going soon enough anyway, in a couple of steps. If you don't use the assistant, just keep going and we'll get there. Name the wireless configuration. The ORiNOCO software lets you switch between numerous wireless configurations—such as if you have one setup at home, another at work, and another for the coffee shop (with wireless access) that you frequent downtown. Name this one appropriately, something like Home Wireless. If you're using the ORiNOCO assistant, this is where it finishes and takes you back to the control panel. Check your network status. The ORiNOCO control panel (and likely other companies' software too) shows a status bar for the strength of the signal it's receiving, as well as which configuration you're using and other status information, such as the card's and AP's firmware revisions, serial number, and so on. If there's no signal strength, make sure you're using the right SSID, or move close to your AP. Switch to the right TCP/IP configuration. If you set one up during the setup process, this is easier than if you didn't. In either case, go to Apple Menu > Control Panels > TCP/IP. If there is a pre-existing wireless configuration (called "Wireless" or "ORiNOCO" or whatever), choose it, then click Make Active. If you need to make a new TCP/IP configuration, choose one that works for your wired network ("Default" or "ADSL" or "Dialup" or whatever you've called it) and click the Duplicate button. Give it a new name ("ORiNOCO" or "Home Wireless" or something else easy to remember) and click Make Active once it's been created. The fields for IP address etc. will be blank for now, since your PowerBook hasn't actually asked to connect to the Internet yet. NOTE: Most networks are set up to configure IP (Internet Protocol) addresses and related information automatically using DHCP (Dynamic Host Configuration Protocol). Either your AP, or another router on the network, or your broadband service through your broadband modem, should do the same. Unless you have a good reason to set your IP address manually (I describe it in the next section), use DHCP. Close the TCP/IP control panel and let your Mac switch over to the new setting. NOTE: You can also set up the AppleTalk control panel (Apple Menu > Control Panels > AppleTalk) to use your wireless card in the same manner. Just set up a new configuration as described for TCP/IP above, then pick ORiNOCO from the popup list at the top of the AppleTalk window. If you're only interested in Internet access for now, you can do the AppleTalk thing later, or not at all. Restart your PowerBook. Strictly speaking, you don't need to restart, but I find it's a good way to clear your Mac's head (and your own, after all that plugging and clicking and typing and checking). Sometimes if you don't restart, the Mac tries to generate its own IP address or something, and won't go online. A restart usually brings things around. Check your status. Once the PowerBook has booted up, check the status lights on your wireless card (if any), as well as any monitoring applications, control panels, or control strip modules. They should indicate that the card is active, connecting wirelessly to your AP, and getting a decent signal. If signal strength is bad, move closer to the AP. NOTE: If you're using a router, gateway, or firewall, most likely you'll have an address of 192.168.1.something (the 192 subnet is what they're supposed to use). If you're hooked straight through your AP to a broadband modem, it will be something else. However, if it's 169.something.something.something, that address is probably internally generated by your PowerBook, and you won't be able to get out onto the Internet. Check that you haven't missed a step somewhere. You're done! (About darn time.) Have some fun. 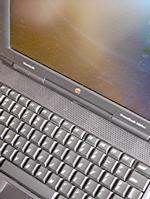 Take the PowerBook to the kitchen or the back porch or the front yard. Walk around with it (careful not to drop it). See how far you can get from your AP and still receive a signal. Surf away. Pretty spiffy, eh? If you want to keep others from being able to monitor your wireless network (at least in theory—most people's network traffic isn't interesting enough to look at, and it would require being within reception range anyway), then you can set your AP to use wireless encryption, which mathematically scrambles the data being transmitted so that only your computers can read it. Encryption is complex topic that I don't understand very well, but you can read about it if you want. In simple terms, just think of it as a way to "lock up" your data between your AP and your computer, so even if someone somehow intercepts the radio signal, it will be meaningless to them—unless they work reasonably hard to pick the lock. In 802.11b Wi-Fi land, there are two levels of encryption, both known as WEP (Wired Equivalent Privacy), with the higher level using larger numbers and being more secure. Well, sort of. While they are supposed to use 64-bit and 128-bit encryption keys, WEP has some flaws, so that the two security levels are actually equivalent to much lower levels of security in other encryption schemes. WEP is good enough for most home networks, anyway, in that it keeps someone from parking out front of your house and simply sniffing the electronic packets out of the air with some basic software. The really determined crackers aren't all that keen on my kind of network traffic in any case—if they are, it would be pretty trivial to break through. If your traffic is more sensitive, find ways to add additional security to your system, such as by encrypting e-mail or using a virtual private network. The more modern Wi-Fi Protected Access (WPA) encryption is, as far as I know, unavailable on wireless cards that work with PowerBooks as old as mine. NOTE: The ORiNOCO Gold card supports both high- and low-level encryption. The Silver card supports only low-level encryption. The old Bronze card supports none at all. That's the only difference between them. Turn on encryption on your AP. How to do that varies depending on which AP you have, but it usually involves entering some sort of password you make up, which the AP then uses to generate a long string of letters and numbers—a hexadecimal WEP encryption key. The high-level encryption key, not surprisingly, is longer than the low-level one. Since the ORiNOCO control panel hides the keys as you enter them, you might find it best to type the key provided by the base station into SimpleText (or another text editor or word processor) first, then select it and copy it to the Mac OS clipboard (command-C on the keyboard). Next, open the ORiNOCO control panel. Select your wireless configuration and click Edit. Make sure you're set to Access Point/Base Station mode, then check the Use Encryption check box. Paste the key into the Key fields (command-V on the keyboard). I actually pasted the same key into all four and selected the first radio button, but I'm not sure whether that's necessary. It should look something like the graphic I've attached. Click Save, confirm the change, and then click Activate in the main control panel window. That should do it. It worked for me, anyway, with an ORiNOCO Gold card and 128-bit encryption set at my Linksys access point. If it doesn't work for you, make sure your card and AP are set to the same level of encryption, ensure that they can use the same level of encryption, and re-check the keys to confirm that you entered them correctly. Turning on encryption generally keeps anyone from seeing what you're transmitting, even if they do try to eavesdrop. It's good to know that anything that's encrypted in a normal Internet session is also encrypted over top of the wireless connection (online banking or anything else with an https:// address, encrypted e-mail, etc. ), even if you have no encryption set up for Wi-Fi—so you shouldn't worry too much. And you'll have to leave it off if you're one of those kind people who wants to leave your AP open for others to use. TidBITS has a good article about the various security considerations for wireless networks, and will help you decide whether you need or want to use encryption. How the various relevant Mac networking control strip modules and control panels work together with wired and wireless connections (even at the same time, if you want). Setting manual IP addresses for your computers. Using multiple networks in the same area. "Stumbling" (searching) for open networks in public areas. Bundling settings for different places using Apple's Location Manager. Next-generation Wi-Fi standards and encryption. Other wireless technologies, such as 1x and GPRS cell-phone data connections, ultrawideband, and other spiffy jargon. Here's one thing I want you to do right away: change your AP's password—otherwise any old schmoe can come in and play with your network settings if they try. Changing the AP's name, your SSID, and whether that SSID is broadcast are also useful. Check your AP's instructions to find out how to do those things, then make sure your card is set to use the new values. © 2003-2004 Derek K. Miller. Some rights reserved. You may use content from this site non-commercially if you give me credit, under the terms of my Creative Commons license.